Living in a beautiful apartment allows you to maintain the active lifestyle you enjoy. Whether your job requires you to be away from home for extended periods of time or you simply value the ability to spontaneously get up and go, apartment living enables you to be who you are. If this describes you, however, one factor can be challenging: how to balance healthy eating with a busy lifestyle. In honor of National Nutrition Month, following are 8 ways to make the best of it all. 1. Choose the grocery store over the drive-thru window. If you get hungry during the drive to work, to home, or to another state, look for the grocery store rather than a fast food chain. Your options for healthy foods are limited, or non-existent, in fast food restaurants, but a grocery store provides you with a wider, fresher selection. Many grocery stores now offer expanded lines of prepackaged meals, salad bars, and deli foods for health-conscious consumers. 2. Make water your beverage of choice. Many times, when you feel hungry, what your body actually needs is water. Packing water with you or choosing water at the store will keep you from buying those whipped frozen concoctions or other sugary, caffeinated drinks. It will also help you feel fuller longer so you can resist temptations. 3. Keep healthy snacks with you. Packing healthy snacks will keep you from buying processed foods from the convenience store or vending machine. Consider keeping a cooler in your vehicle as well. Doing so will allow you to keep those water bottles and healthy foods readily available to you while you’re on the road. 4. Don’t keep junk food in the apartment. If you have junk foods in your apartment, they can be very tempting, especially late at night after a long day. Instead, stock up on healthy foods with a long shelf life, such as cups of yogurt, fruits, vegetables, and protein bars. 5. Prepare healthy snacks and meals. Another smart way to balance healthy eating with a busy lifestyle is to clean, chop, and pack those healthy snacks and meals in advance. Choose a day to complete your grocery shopping, and then prepare, portion out, and pack meals for every day of the week. Having fresh fruit salad that you prepared and set in separate containers, for example, makes it easy for you to choose that over something less healthy. Better yet, consider buying these snacks and meals pre-chopped in order to save time. Because you don’t spend a lot of time at home, choose ingredients that can be frozen. 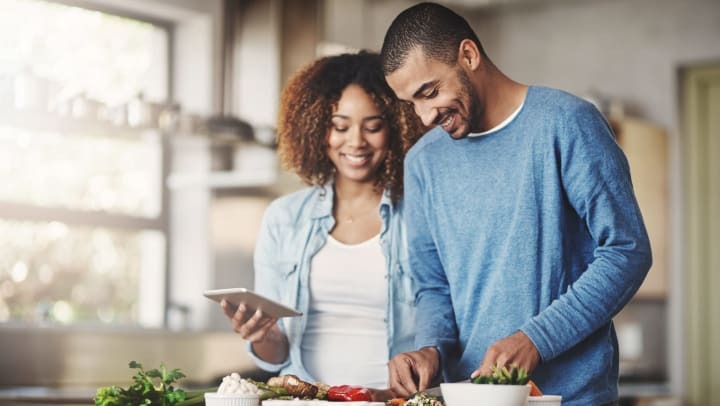 Additionally, consider placing the meals you prepare in the freezer until you’re ready for them, and explore one-pot meal recipes to help speed up your preparation time. As you’re planning healthy meals and snacks for the week, remember to pack for work too. 6. Look for the healthier options on the menu. Life on the go often requires eating out, and it can be an enjoyable opportunity to socialize with friends, family, and business contacts. Don’t cheat yourself out of these special moments. Restaurants offer plenty of healthy options, so choose the meals that work best for you depending on your needs. You may even want to explore the restaurant’s menu online in advance in order to make the best choices when you get there. 7. Take advantage of grocery shopping services. Grocery shopping delivery services are available through individual stores or apps such as Shipt and Instacart. Choosing healthy items online can help you avoid being tempted by store presentations and food triggers. Many apps, like MyFitnessPal or HappyCow, are available to educate you about the nutritional value of various foods. 8. Have healthy meals delivered to your door. Go beyond basic takeout with healthy meal delivery. Services are available through businesses such as Home Chef and Blue Apron. Some, such as Local Crate, even source local foods, so you can eat healthy while supporting your local community.